A global provider of high-performance bulk material handling technologies has named two new distributors of its complete line of conveyor components and flow aids, including belt cleaners, transfer point solutions, safety products and training, air cannons and field services. Martin Engineering RSA made the announcement as part of its ongoing commitment to deliver innovative products and technical support to the region’s bulk handling applications in mining, quarrying, coal handling, cement manufacturing and other heavy industries. Alco Mining & Industrial Supplies and Vandlovu Mining & Industrial Supplies are sister companies that will both serve the Phalaborwa and surrounding areas, able to provide sales and support for the entire family of Martin Engineering products. Alco has been a driving force behind the growth of the mining industry in the Phalaborwa-Hoedspruit-Tzaneen triangle for more than two decades. The company was originally formed to supply air tools, lubricants and lubrication equipment to mines and mineral processing operations in the region, and quickly grew to become a leading independent distributor in the area, representing a comprehensive range of products manufactured by recognized leaders in their respective fields. Vandlovu originated as a supplier of filters and lubricants, later adding hydraulic hoses and fittings to its portfolio of products and services. The company maintains a mobile hydraulic vehicle, outfitted to repair hydraulic systems on-site and available 24 hours a day, seven days a week to help customers reduce downtime and expenses. Since 1944, Martin Engineering has developed innovative products and services for bulk solids handling applications around the world. The company attributes its success to the design of field-proven, cost-effective solutions for "real- life" problems. 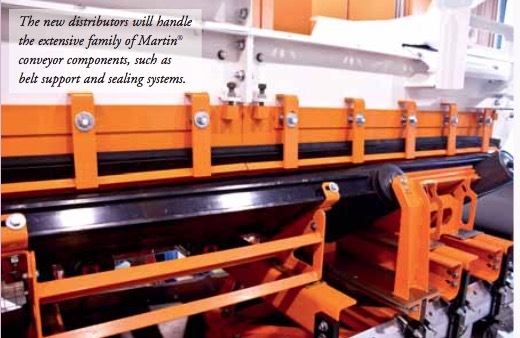 Martin Engineering products are designed for tough industrial conditions, engineered for simplicity, safety and efficiency, and built to allow easy maintenance.